Robertson, Lynn C. Sagiv, Noam. 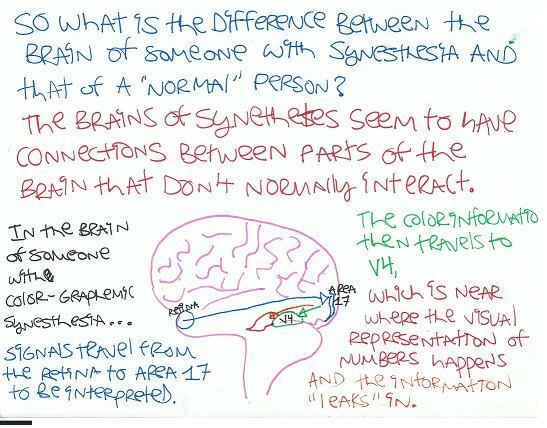 Synesthesia : Perspectives from Cognitive Neuroscience. NC, USA: Oxford University Press, Inc, 2004. Web. 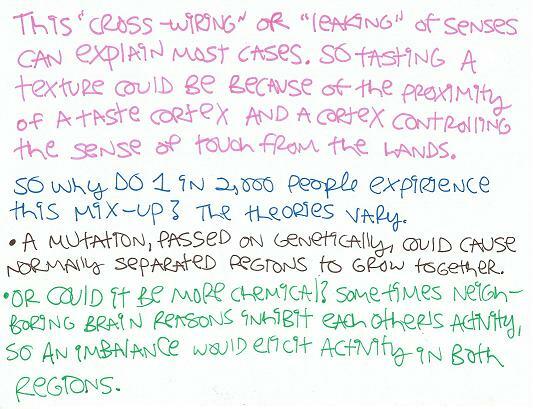 Ramachandran, Vilayanur S., and Hubbard, Edward M. “Hearing Colors, Tasting Shapes.” Scientific American. 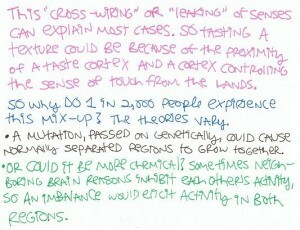 http://cbc.ucsd.edu/pdf/SciAm_2003.pdf. Web. 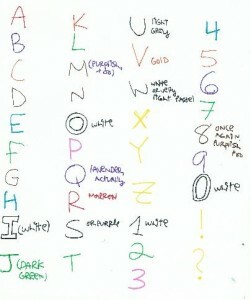 Synesthesia Test. 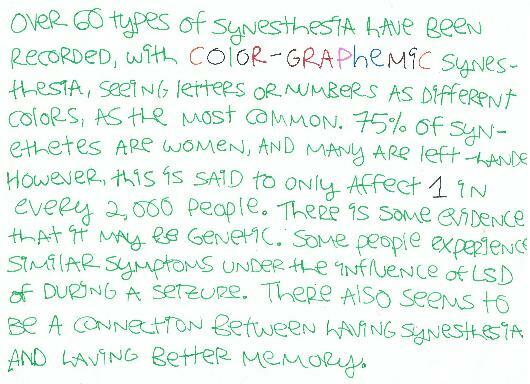 “Synesthesia Statistics.” Synesthesia Test. 2011. 08/06/14. So here’s my final project. 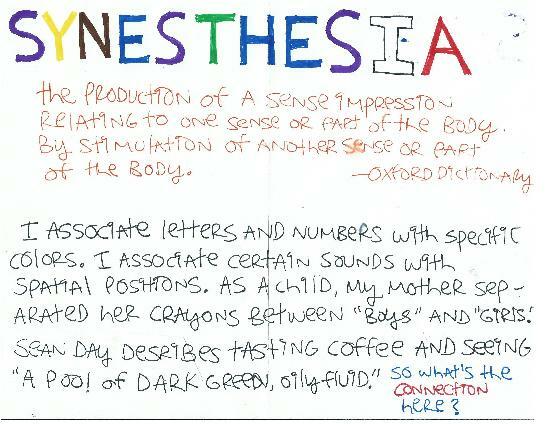 I really really wanted to make it a more multi media type thing to really capture the complexity of having synesthesia but I don’t really have the resources for that. 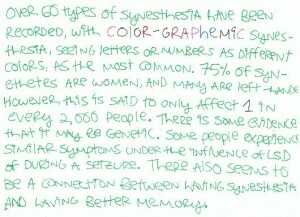 I am interested in synesthesia because I have a slight common form of it. 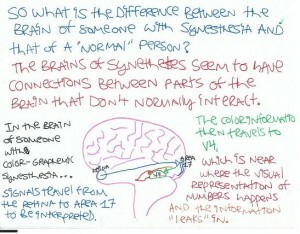 I also think I would have been able to give better explanations through speaking, but I don’t currently have a web cam. Oh well. This entry was posted on Thursday, August 7th, 2014 at 3:03 am and is filed under Uncategorized. You can follow any responses to this entry through the RSS 2.0 feed. You can leave a response, or trackback from your own site. 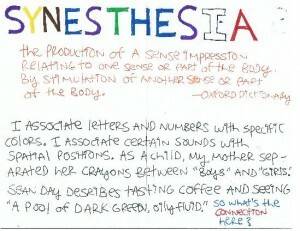 Great job depicting what it’s like to have synesthesia and the neuroscience behind it. How old were you when you first realized you had it? How did you know that your perception of numbers and letters was different than people without synesthesia?